When browsing the offerings at farmers' markets its not uncommon to see something unfamiliar. I think one of the greatest things about shopping at a Farmers' Market is finding foods you may not have heard of and learning how to prepare them and possibly integrate them into your food life. As shoppers, if you ever see something at the market that you are not familiar with, just ask your friendly market vendor. We grew it, so you can be we know a bit about it and we're MORE than happy to share! So, I decided I'd give a primmer on one product that I didn't sell much of last week--Mustard Greens! 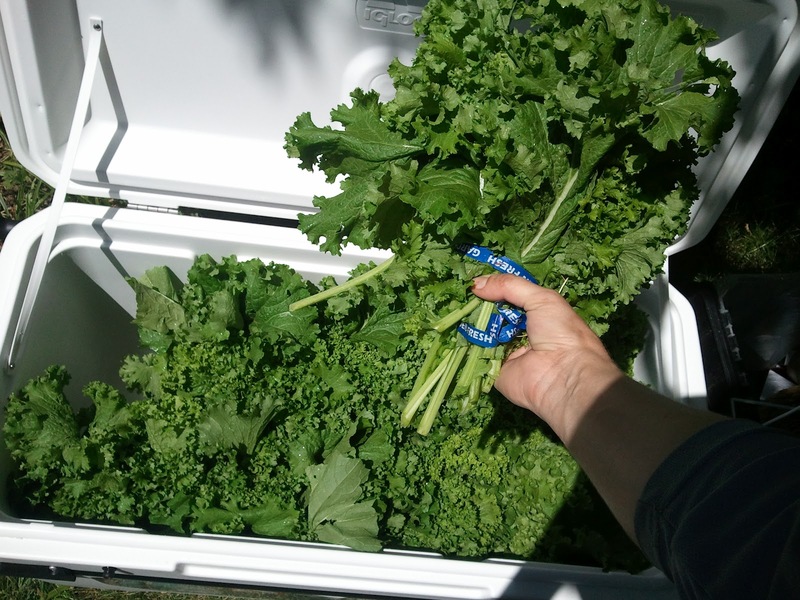 My personal experience with mustard greens stems from my upbringing in Tennessee where "greens", a general term that could mean collard, turnip, or mustard greens, were grown on my grandparents' farm and served to me regularly as a kid. I didn't cook greens myself until I became vegetarian 11 years ago, which is ironic since most southern style greens involve ham hock as a primarily flavoring agent. 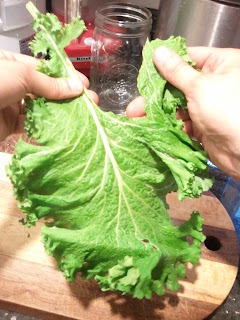 Anyway, here's how I do mustard greens; its simple and tasty and you can riff on it as you like. The following instructions can work for any of your southern greens or even kale. You may need to adjust cooking time by a few minutes here or there to accommodate more tender or more tough leaves. 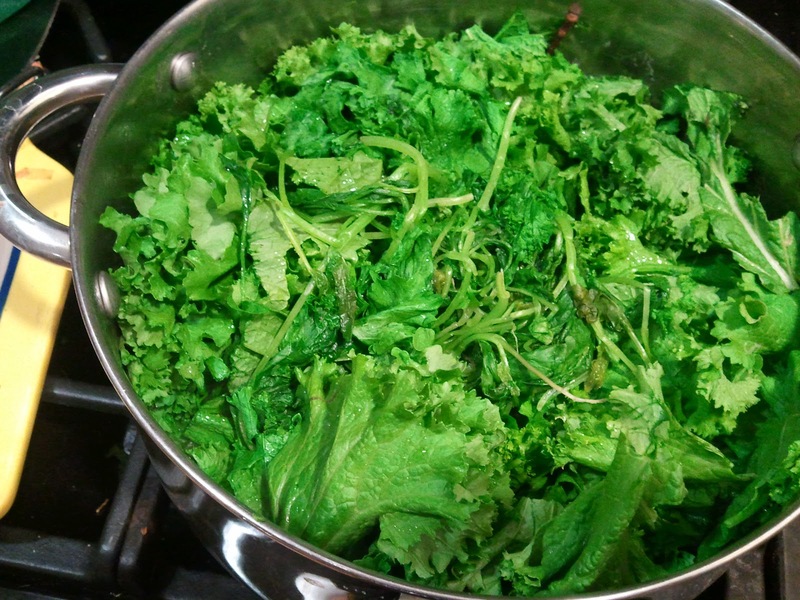 You can even cook a mix of greens in one pot. Mixing your greens gives you a more complex and interesting flavor! 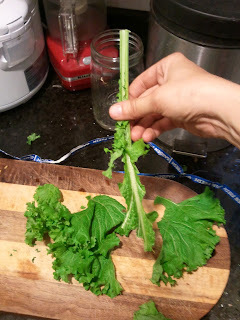 Mustard green leaves are big with big stems. In most cases I'd recommend removing the stems because they take a longer time to cook and can be fibrous. To remove the leaves from the stems, I just hold the leave in one hand and with the other hand rip the leaf away from the center stem. Next you'll want to chop the leaves into more bite sized pieces. Remember that the leaves will shrink down when cooked, so when I chop my leaves I like to chop them roughly, leaving them in fairly large pieces. My chopped pieces are usually 4 or 5 inch pieces, or so. When I've had greens at soul food restaurants, usually the greens have been chopped into much smaller pieces--something like 1 or 2 inch chop--which gives it a different texture when cooked. Its up to you! While you're chopping, put some water on to boil. You'll want to use a big pot because you're going to stuff it full with raw leaves. Remember the leaves will shrink a LOT so in order to get a good portion for a couple people you'll want to fill up your pot at the beginning. You'll want to put a few inches of water in the bottom of your pot. When you first add the raw leaves, the water will not come close to covering all of them. Don't worry, those leaves will wilt down into the water. As I chop the leaves I add them to the water as it is warming to a boil. When you fill your pot you'll want to stuff as many raw leaves in the pot as possible. You'll have to push on the top of the raw leaf pile to make more room in the pot. Bring the water to a good boil. As the leaves on the bottom begin to wilt, use tongs to turn the pile so that raw leaves toward the top eventually end up on the bottom. Once all the leaves have started to wilt, I add my seasonings. Since I don't eat meat, I tend to make up my own seasoning combinations. 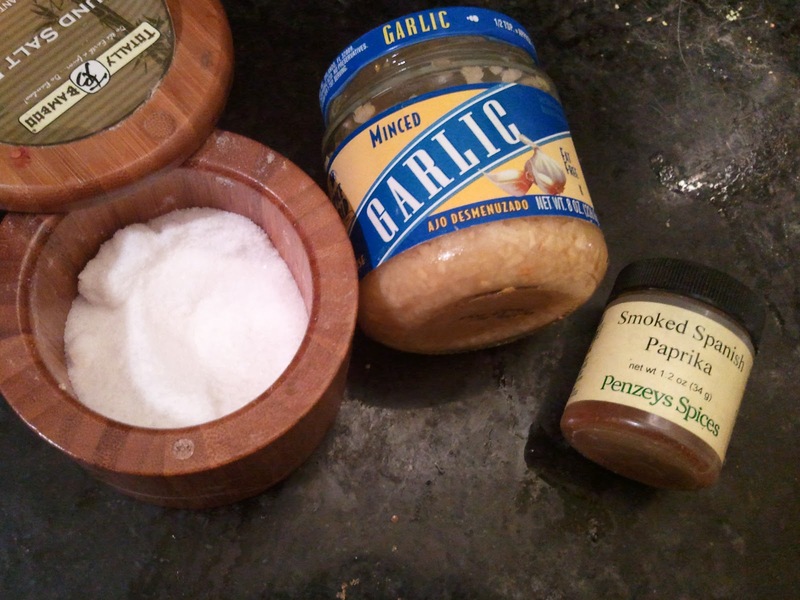 I think smoked paprika and garlic are a good combo, and of course you'll need salt (a large pinch). Other flavoring ideas include vegetable broth instead of water or chopped onions (sauted for a few minutes in olive oil or butter first). Now, cover the greens and let them simmer until all the leaves have completely wilted. This usually takes about 15 or 20 minutes. Once all the leaves are wilted down, I take a taste to see if they're done. If the leaves are tough to chew, they aren't done. Leaves should be tender, easy to bite but not mushy. The true southern way is to cook the life out of the greens, cooking for a total of 40 to 50 minutes, but to me that's too much. I like me greens to have a bit more structure. Its a personal preference. Find what works best for you. Turn off the heat and you're ready to serve! I'll also recheck my seasoning at this point and add more salt if I feel its needed. I like to drain the water away from the greens before serving. If you don't, you'll end up with a big puddle of "greens juice" on your plate which can make other foods soggy. To do this, I just set a metal collander on top of my stock pot and then use tongs to move the greens from the water to the collander. Let 'em sit in the collander and drain while you're setting the table. When I was a kid, we served greens with a hot vinegar sauce made from packing hot peppers in vinegar (sorta like making pickles) then using spicy vinegar as a tangy sause for the greens. I haven't seen this kind of hot pepper vinegar around here, so usually I just use balsamic vinegar on my greens. Just sprinkle about 1 tsp of vinegar over your greens before digging in. Now dig in! For me, greens remind me of my southern roots so I like to serve them with things that remind me of meals from my childhood. Usually this means slow cooked dry beans (pinto, white, lima, whatever you like! ), either homemade mashed potatoes or mac and cheese, and cornbread. Mmmm mmmmm! I'm getting hungry just thinking about it! -Add leaves to boiling water. Remember leaves will wilt down substantially so pack as many leaves in your stock pot as you can. -As leaves begin the wilt, turn the pile of leaves over in the pot so that the raw leaves on top get cooked too. -Once there are no more completely raw leaves in the pile, add your salt, garlic, and smoked paprika then put on the lid and allow to simmer for 20 minutes. 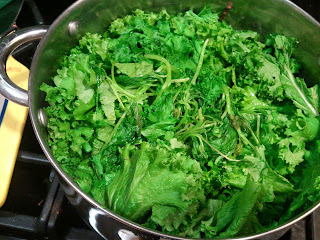 -Taste greens to make sure they're tender but not mushy. If they're still chewy or fibrous, allow them to cook five more minutes, then check them again. -Taste greens and add more salt if necessary. 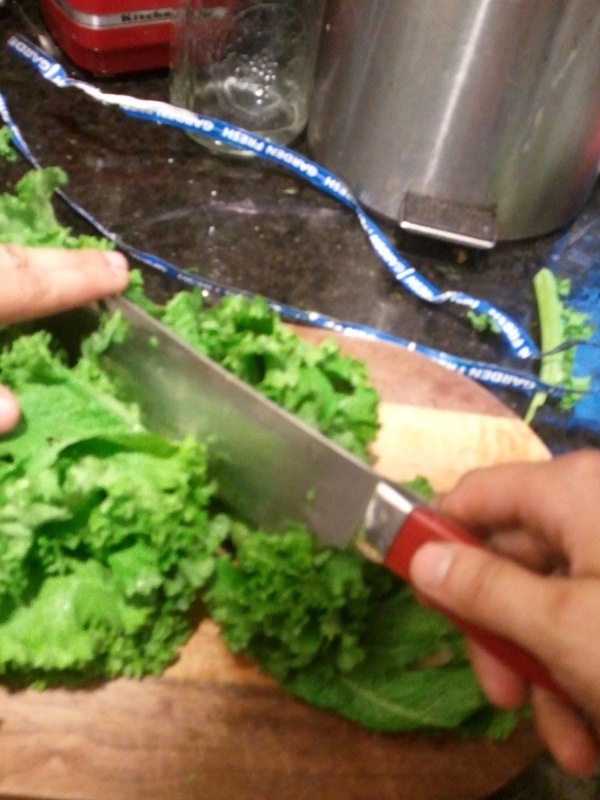 -Before serving, drain the excess water away from your greens, so you don't end up with a puddle of water on your plate. -Serve greens with a drizzle of vinegar (any kind will do, but spicy vinegar is the best). -Make a southern meal by serving mashed potatoes or mac and cheese, slow cooked dried beans, cornbread, and sliced tomatoes (if in season). Enjoy!